First off, thanks for all your great comments on yesterday's music fest & for reminding me that I really do need to get into the habit of sharing my new favorite artists/songs/albums more often! Duly noted. Lately I have been thinking about having to go back to "re-creating" my looks on the weekends. Seeing that the sun is saying good-bye earlier & earlier & that my boss doesn't think taking photos of one's outfit is a good enough reason for leaving work early, I am left with no other option. In fact, this is a look that I wore last week to work, carefully laid out on my desk chair after work (when I got home at dusk), & put it back on to document it this weekend. And in doing so I had a funny observation. Somedays I could put on a potato sack & feel good about myself. You know those days when you are just on, feeling fierce & fabulous. Other days I can pull out all my favorites, the forgiving jeans, the top that accentuates in all the right places, look in the mirror & just feel "meh" about it all. I'm not sure if it is the barometric pressure, my sign being in retrograde, the cycle of the moon or what, but somedays I just feel "cuter" than others. When I wore this outfit last week, I got dressed in the morning & felt totally boom-shacka-lacka. In fact, I was really feeling the boyfriend jeans + bootie combo! And then putting it on again Saturday, I was just so "blah"! So now I'm curious, do you have "cute" & "un-cute" days too... for no apparent reason? Love this look. And I absolutely have days of not feeling good or feeling amazing no matter what I put on! Thanks for sharing. I don't know if this is your answer, but it would be for me: Even though I wear my clothes multiple times, I never wear exactly the same outfit twice. So there's something exciting about wearing every outfit because I've never worn it before. I've had to "recreate" outfits a couple times and it's not quite as exciting just because the newness has worn off. Maybe that could be it? I can completely relate! There are definitely days when I'm just not feeling it, even in one of my favorite outfits! 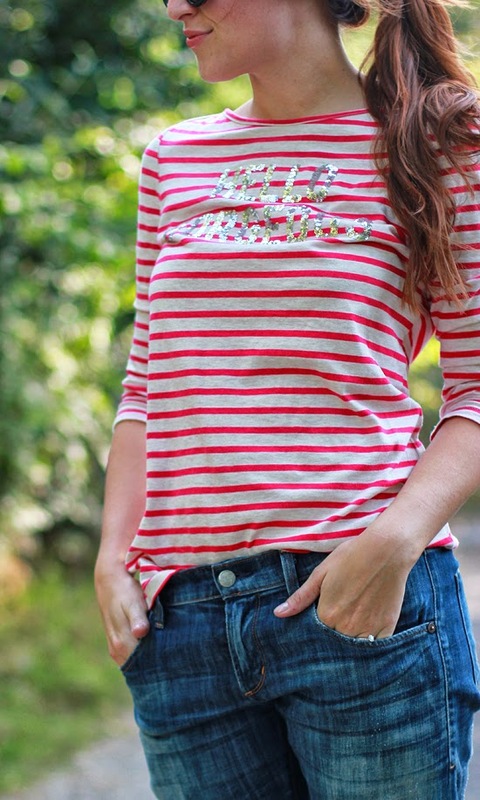 Love that shirt and you have such a pretty blog! Hope you are having a good week and I think everyone has days where they feel cuter than others. It's normal. I know what you mean about the sun- I tend to run to the park around the corner at lunch and take pic's with my self-timing camera. Of course if you look at my blog the last few weeks this hasn't happened. This is a cute outfit and I get what your saying about feeling *meh*. However, I was shocked these booties came from Old Navy! I so seriously need to go there and soon!! i totally have those days! usually they happen when i feel like my face isn't looking good. hah! love the boots though! What a cute look! I def have those 'no matter what - uncute days' My hair will refuse to cooperate and no amount of makeup will help.. sigh. I definitely have days where I just hate my outfit/hair/makeup and everything just seems off. Then there's days where I feel so pulled together and fabulous. I LOVE that shirt! I didn't buy it because it felt weird around my chest. This looks well, gorgeous on you! I definitely have those days! It can be the same exact outfit but just doesn't have the same feel. Totally know what you mean about throwing a potato sack on and somehow feeling okay with because you're just comfortable! I LOVE this look! You look so cute and comfy! Stripes are just the best! Such a great casual look! I'm getting a little sad that the sun is setting earlier and earlier too. It definitely makes it tough to get those photos in before it's too dark. Totally swooning over your boots - they're a must-have for fall! Uh, totally agreed! My cute days usually coincide with great hair days, and vice versa. Isn't it weird how sometimes cute casual looks can make you feel more fabulous than super dressed up ones?! I don't get it. Love this outfit. Wearing comfy clothes can be soo relieving!